When I first started writing Women Making Strides, I wondered how readers would react. I was encouraged and excited when I received a nomination from Sharla Shults for the One Lovely Blog Award. Sharla makes a special effort to recognize other bloggers. 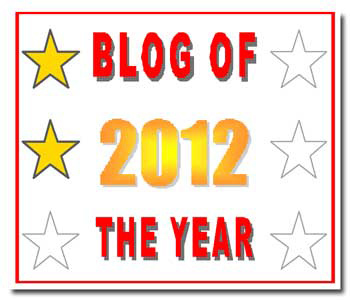 Now she has nominated Women Making Strides for the Blog of the Year 2012 Award. Women Making Strides has won two stars, one from the blog Catnip Of Life and the other from the blog Awakenings. Thank you, Sharla! I’m honored and excited that Women Making Strides is a recipient of the award and has earned Two Stars. Encouragement from strong writers like Sharla mean a lot to newer bloggers like me. Sharla has earned the maximum of six stars on both of her blogs. For my readers: Has someone made a special effort to recognize or encourage you? Please share your thoughts in the comments below. This entry was posted in Awards, Encouragement, Gratitude and tagged Awards, encouragement, Gratitude. Bookmark the permalink. Thank you, Susan, for such a warm acceptance. Looking forward to many more visits in the New Year! Congratulations on your award! Isn’t it exciting! And I am honoured by your recognition. Thank you so very much. Thank you, Sue, for a great list of blogs. You keep me enlightened! Thanks for visiting, everyone! I appreciate your comments. Thank you Susan for your recognition of my blog. I am so grateful!